Letting your chin out for play time will be great for his emotional health. Watching a chin out for play time is a real joy, but unless you have time to keep an eye on him and interact with him, don't let him out. Chins can get into trouble very quickly. Don't be so occupied with watching TV, reading or talking on the phone that you are not paying attention to him. This is your time together. You should make the most of it. 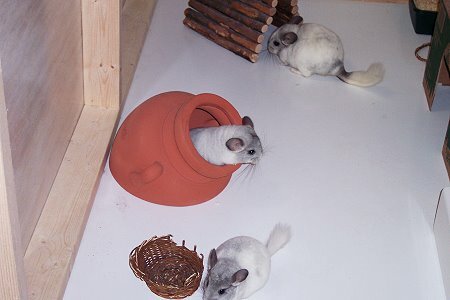 The bottom line is, if you are not willing to make a chinchilla part of your everyday life and really don't have time to spend with a chinchilla companion, spare him a life of loneliness and depression and don't get a chinchilla. Do not ever put a leash on a chinchilla! Once again, these are gimmicks sold by pet stores and are not safe for a chin. Chins have very small and fragile bones and can become injured very easily or entangled with a leash. It will also cut into their fur which is not healthy. You need to provide a safe indoor play area for your chin's exercise time. Chins love the opportunity to run around, and this is a great way for them to bond with you. This will allow him time to explore you by climbing on you and get more comfortable with you. If you sit or lie on the floor when he is playing, he will use you as part of the obstacle course. He will sit on your lap, climb all over you and many will even rebound off of you! He will look forward to his play time with you. So that you can start to build a trusting and long lasting friendship, we advise people to wait at least a week before letting your chin out to play for the first time. The purpose of this is so that you do have some trust established and he will allow you to pick him up. Otherwise you will be chasing him to get him back into the cage, and this is very stressful and tiring on the chin and frankly for you, too. You have to chin-proof the area you will allow the chin to play in. Make sure there are no exposed wires he can chew on. If you have any wires at his level he will bite them and it would only take one nibble to kill him or hurt him severely. Clear tubing can be purchased to cover your wires. You can get it from any home improvement store or bunny supply resources online. You do not want him to chew on painted or varnished surfaces. If you have grandma's priceless antique end table sitting there, either move it, block it or wrap a towel around the legs. Chins will test chew everything. Lie down on your floor where you want to let the chin play and look around. Now you are on his level. What do you see? A small hole under a counter you didn't even know was there? Well guess what ... you would be amazed at the small opening that a chin can get into. Curiosity is usually what gets them into trouble; they mean no harm. Very often though, once they get into a predicament, they get nervous and panic and won't come right back out. That's when you start to get nervous and all the sweet talk and treat bribes in the world won't get him out. Whatever you do, don't get mad or yell at him. This will only make him barricade himself in his new found hide-away. We have heard of more than a couple of times when people have removed moldings, pieces of wall and so forth to free their chins. You can easily prevent all this by checking things out on his level and preparing an area each time your chin has play time or if you have a small space you can designate as his which can stay set up with his toys all the time. You will want to limit the space where your chin will play for the simple reason that you want to be able to keep track of him. Also, it will be easier to get him when it is time to go back to the cage. It is great if you have an area that has at least one wall because chins LOVE to rebound off of walls or as someone once described it to me 'wall surfing'. "I'm a wall surfing Dude!" Give him things to play with to occupy his time so he won't look for trouble. 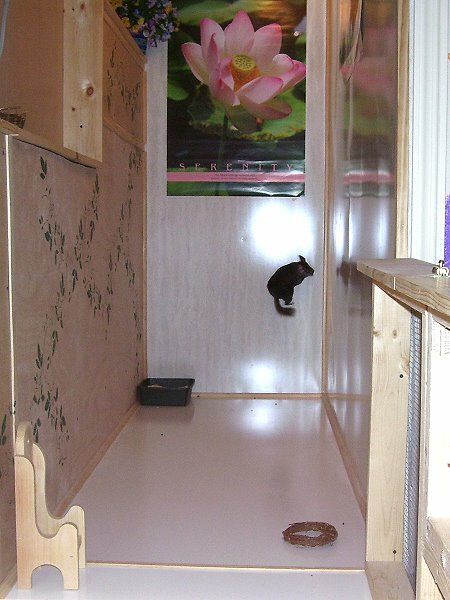 Give him an obstacle course to play on and make things that are different than what is in his cage on a daily basis so it will be adventurous. We also make sure to have things that they can chew when they are out playing; such as a willow wreath, willow basket, organic apple sticks, fiddle sticks etc. I recommend that you slowly build up the time that the chin is allowed out for play. If he has never been allowed to run around or has not been out to play in a while, he will get tired and overheat more easily. He will need to build up stamina each time, just as a person who starts to exercise after not doing so in a while. I usually recommend people start out their chins' play time for about 20 minutes. Then add five minutes every day until you reach a comfortable schedule. It is very important that you don't let your chin get overheated. It is vital that the temperature in the room be very cool, below 70° and very low humidity. Sometimes they are so excited about being out that they don't pace themselves and we have heard of chins collapsing and even having a seizure after playing for too long. This is caused by a drop in blood sugar. If your chin is unsteady on his feet or starts to act like he is drunk, that is a serious sign of this condition. You must get his blood sugar back up quickly. If your chin is able to chew, give him one raisin. This is the only time you will ever read these words from me. Raisins are not a suitable treat for chins since they are 80% sugar, but in this case that is exactly why it would help your chin. If he is unable to chew, then you can either rub a very tiny amount of molasses, sugar water, or Nutri-cal on his gums. That is all it should take to stabilize him in about 10 minutes. Young chins and sometimes older chins will do something called 'popcorning'. They will act like a piece of kernel corn right as it pops into popcorn. Standing still they will suddenly spring straight up into the air and very often add a little twist to this movement. This is a very happy chin and it is a total delight watching them do this. Babies will often do this several consecutive times. How much play time does your chin need? Ideally he should get out every day. However, life does not always have a set schedule. If your schedule does not permit playing every day, you should strive to let your chin out at least 4 times a week. That is why it is so important to have a great large cage setup for him on days that he will stay in.